Hope for Nigeria has become synonymous with all campaign slogans every election year, right from the 1979 elections to the present. However, by reason of the constant unpleasant and disappointing experiences suffered by Nigerians, the definition of hope as often preached by political gladiators, seems different from what Nigerians really need and expect. 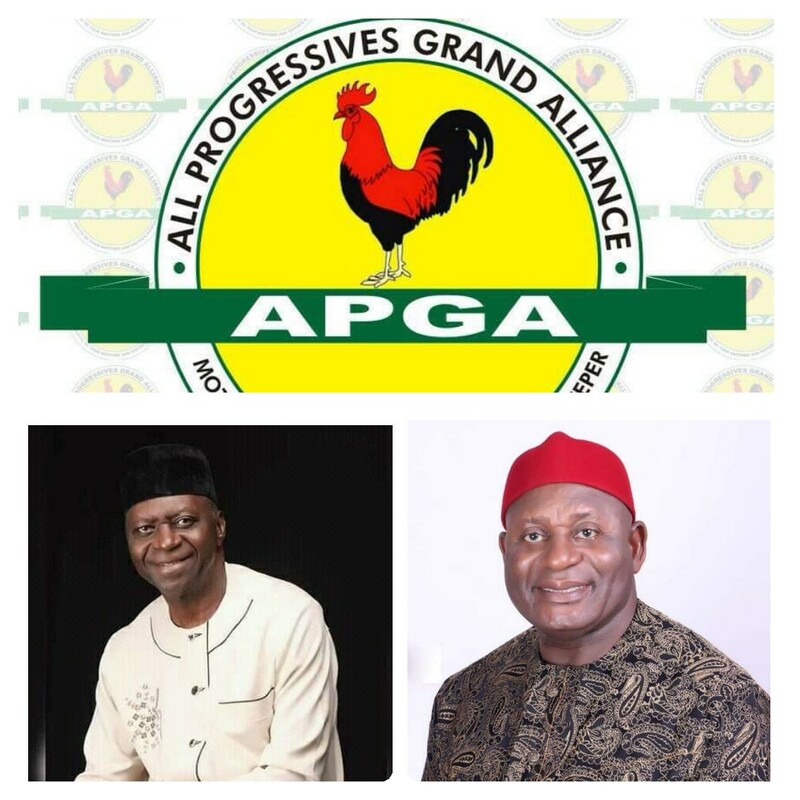 This informed the need to differentiate 'hope' canvassed by many political parties, past and present, from 'real hope' as presented by W.T Gbor and Jerry Chukwueke, the presidential and vice presidential candidates of the All Progressives Grand Alliance, APGA respectively. Sadly, our political environment has become a theatre of sort where all manner of drama play out every election year. In the past, regional, ethnic and tribal sentiments, form the theme. But today a lot more has been thrown into the mix like avarice, nepotism, favouritism, high level corruption, evident in the gluttonous quest for power and personal aggrandizement. While the jostling for power occupies the selfish minds of the covetous politicians, the masses are neglected and recruited during election for a pittance. The trend is consistent and is being recycled lately to favour a few who had pitched tents with either the People's Democratic Party (PDP) or the ruling All Progressives Congress (APC). The two parties, having mastered the art of perpetuating corruption in different guises, take turns to beguile Nigerians with false hope, while mindlessly looting the national treasury. The constitution, skewed to favour them, constantly protects only the rich while the poor suffers. The power of the constitution is invoked at will to proscribe and annihilate a peaceful people while protecting and canonizing a murderous horde. The country continues to cringe in fear as marauding and killer herdsmen, protected by identifiable forces, wet the earth with the blood of fellow countrymen. What is more, their power drunk ilk, look on in self denial, pointing accusing fingers from rocky palaces. Hunger and deprivation became the hallmark of a once prosperous country, richly blessed with human and natural resources. As countries hitherto on the development band moved on to become great economies of the world, Nigeria had moved backward to become the poverty capital of the world. Our mono economy continues to stagger under the burden piled on it by the rapacious and overtly greedy political class represented by the PDP and APC. Sadly, their gluttonic thirst could not be quenched even after drinking tons from the oily elixir of our black gold. With the world dynamically evolving towards renewable energy, our oil-drunk, deaf and myopic leaders continue to grovel for crumbs. They are so much blinded by lust for power and ill-gotten wealth that they continue to scramble, losing sight of the fundamental responsibility of nation building. Even with all their barefaced antics and guile, they still approach unashamedly, begging for votes, bringing with them false hope as they had always done. They do this consciously having developed a formula of subjecting the people to extreme poverty and hunger, which leaves them no option than to follow sheepishly, whoever dangles bread and a few naira notes before them. Then the usual strings of hopeful rhetoric and unfulfilled promises follows viz: "We will provide water, we will make power stable, we will provide jobs, we will improve security, free education for all, free housing for all, free health for all, salary for the unemployed, free cars, free jets, free ships, free air..." Free everything, both things realistic and unrealistic. The refrain has been the same over the years and nothing has changed. The forthcoming election still parades same breed of lecherous, avaricious, dubious and nepotistic politicians in what many have termed a two horse race between the PDP and the APC. However, a third and hitherto unrecognized force, keeps gaining momentum in APGA's Gbor and Chukwueke. The real message of hope resonates in the clear and sound policies outlined in their manifesto. The vision to restructure Nigeria along fiscal and economic lines and creation of modern and more lucrative ways of doing business is one sure and indisputable message of real hope. Gbor and Chukwueke have continued to reel out facts with regard to the problems beclouding Nigeria, offering solutions and seeking answers where necessary. They have not come with the serpentine double-flicked, sugar-coated and decptive tongue of the usual Nigerian politician. They are not promising heaven on earth and 'free everything' as others do. They are realistic enough to recognize that everyone must be involved in repositioning Nigeria for greatness and prosperity. This is buoyed by the APGA mantra that no one and no place is left behind. Chief among their policy statement is the urgent need to diversify the economy and move Nigeria away from mono economy and over dependence on oil. This is an issue that is long over due. However, selfishness and lack of will had derailed past leaders from the right path. They had concentrated on the huge income from oil and lost sight of the need to tap into various deposits of natural resources, thereby not developing other sectors of the economy. Gbor and Chukwueke have re-established hope with their commitment to realizing this noble goal. Next is also another urgent need to restructure Nigeria. This has proved to be the focal point of every ongoing political discourse. But while most discussions tilt to a geographical restructuring and decentralization of power, APGA's Gbor and Chukwueke introduced a new and more rewarding perspective: The fiscal and economic restructuring of Nigeria. This is with a view to having geo-economic zones as against geo-political zones in the country to wake up the consciousness of Nigerians to the importance of economic empowerment rather than political empowerment. This will also engender less dependence on federal allocations and promote self sufficiency. The introduction of modern trends in businesses and commercial activities will also help to curb unhealthy rivalry and unnecessary bloodshed. Ranching of cattle and other livestock is the way to go. Establishment of ranches and improvement of irrigation in the North provides for better management of livestock and year round grazing fields. This presents a better remedy to the present malady of herdsmen/farmer clashes than the unappealling establishment of grazing fields all over the country. The battle against terrorism fought conscientiously all over the world, appears to have become a circus show within political circles in Nigeria. Phrases like 'technically defeated' suddenly emerged to defend obvious incapacity and lack of needed technicalities and or political will to deal with the notorious and murderous sect. The odious and nepotistic body language yet pervaded as pythons, crocodiles and cats, took turns in murderous blood letting of poor, unarmed and hapless citizens while murderous rapists and genocidal extremists rampage free. This trend must end. Gen Gbor and Jerry Chukwueke possess the requisite experience in diplomacy, negotiations and combat to deal with situations as this. They are equally poised to hire mercenaries, if needed, to fight and clear out Boko Haram and all terrorists from Nigeria once and for all. The reign of peace in Nigeria will surely stabilise the nation and make it even more attractive for local and foreign investors. The ripple effect will be a thriving economy, jobs for Nigerians, security and safety, adequate healthcare, quality education, infrastructural development, stable and constant power supply among many others. This is the real hope that resides in APGA. It behoves on Nigerians, however, to choose wisely and repose their trust in Rtd Gen John W.T Gbor and Chief Jerry Chukwueke in the forthcoming election. It is our collective responsibility to reject the old, treacherous ways and embrace the new dawn. We should unite completely to vote for APGA. Nigeria needs to be restructured and repositioned towards unity, peace and progress. No one and no place will be left behind in this quest to rebuild Nigeria.